Miniature Bicycle Babe – winning! We got our toddler (S. – Age 3.5) a bicycle a few months ago. We thought she would be thrilled. Instead, because she didn’t know how to ride it perfectly- struggled with pedaling a bit and took a spill, she has basically refused to ride it. The sparkling, purple (ridiculously girly!) princess bike has literally sat in our garage for months. I would beg, threaten and cajole but could not get her on the thing no matter how hard I tried. Every attempt was an exercise in tears so finally, I let it go. It has been driving me nuts. 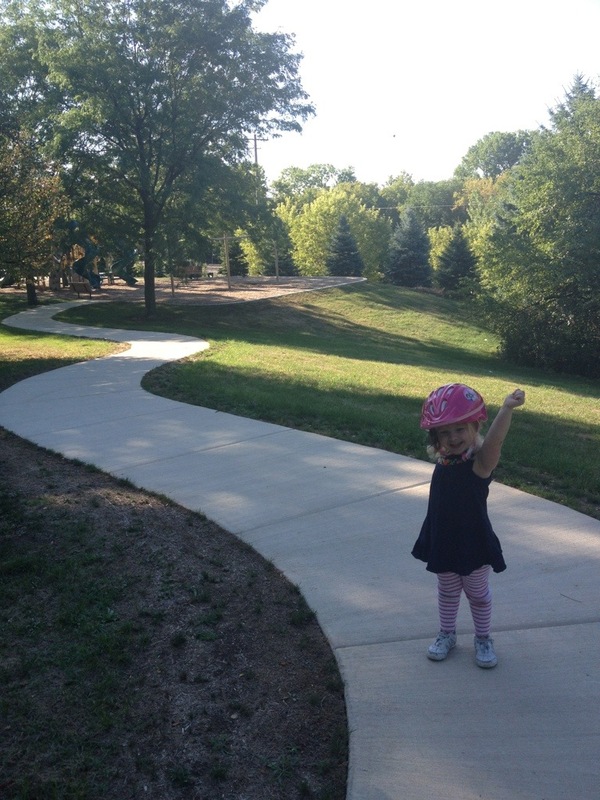 A week ago, we went to the park and she saw her friend R. – Age 5 ride up the park on his bike. She didn’t mention anything to me about it but I know she noticed. I didn’t say anything either. This morning that same kid rode that princess bike over a mile. What had started out as walking the dog S. – Age 3.5 turned into a quest, and I had not the heart to deny her. Accompanied by myself and our pug, she pedaled and pedaled and pedaled, and when she fell jumped right back up. OMG my baby is growing up!